A NASA Hubble Space Telescope composite image shows the positions of comet Siding Spring and Mars as the comet streaked by the red planet, at 2:28 p.m. EDT on Oct. 19, 2014. The famed Hubble Space Telscope has captured a jaw-dropping view of a comet making an incredibly close flyby of Mars. The space telescope snapped the amazing image when Comet Siding Spring (also called C/2013 A1) was hurtling through space near the Red Planet on Oct. 18 and Oct. 19. During its closest approach on Oct. 19, the comet passed about 86,000 miles (138,000 kilometers) from Mars — just one-third of the distance between Earth and the moon. "The Mars and comet images have been added together to create a single picture to illustrate the angular separation, or distance, between the comet and Mars at closest approach," NASA officials said in a statement. "The background starfield in this composite image is synthesized from ground-based telescope data provided by the Palomar Digital Sky Survey, which has been reprocessed to approximate Hubble’s resolution," space agency officials added. "The solid icy comet nucleus is too small to be resolved in the Hubble picture. The comet’s bright coma, a diffuse cloud of dust enshrouding the nucleus, and a dusty tail, are clearly visible." 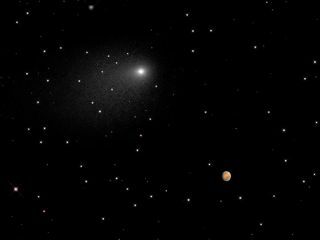 Hubble officials couldn't capture both the comet and Mars in the same frame properly because the planet is about 10,000 times brighter than Siding Spring, according to NASA. The two cosmic bodies are also moving, and Hubble could only properly track one at a time. If the space telescope took an image of both at the same time, at least one of the celestial targets would have been blurry, NASA officials added. Other NASA spacecraft also caught sight of the historic flyby. The space agency's Mars Reconnaissance Orbiter and Opportunity rover both captured images of the comet passing by Mars. NASA's Mars Atmosphere and Volatile EvolutioN (MAVEN) and Odyssey probes were also expected to observe the comet's close pass. The space agency's Curiosity rover was also in position to study the comet. India's Mangalyaan orbiter circling Mars and Europe's Mars Express spacecraft were also expected to observe Siding Spring's flyby.